Oh the virtues of the croquette. Croquettes were a staple menu item when I was a child. I grew up eating mackerel croquettes – probably because salmon was a bit pricey. Mom often made them for Sunday breakfast before church and she served them with buttered white rice. That is a memory I will never forget. While most of the time mom made croquettes from canned mackerel, I learned that they could be made of anything from minced meat, rice, potatoes and vegetables. Mom would pan fry her croquettes in a little Crisco shortening or lard. Perhaps that’s the reason they tasted so good. When I look back, my fondest food memory is perching myself beside the stove top and anxiously waiting until Mom scooped a croquette out of her well-seasoned cast iron skillet with a dinner fork. Once she placed the tester on a paper towel to drain, I would barely let it cool before picking it up because I wanted to devour it before my siblings came into the kitchen. That first, hot, tasty bite was moist on the inside and crunchy on the outside. And for me, it was the perfect prelude to what was to come. 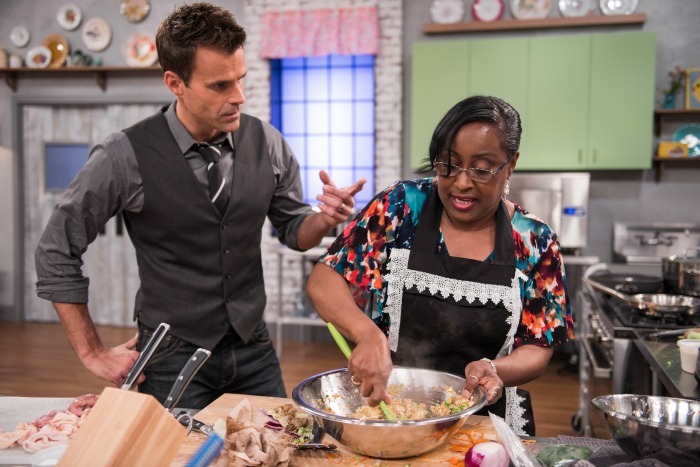 Late last year, you saw me make chicken croquettes on the Food Network show, Clash of the Grandma’s. 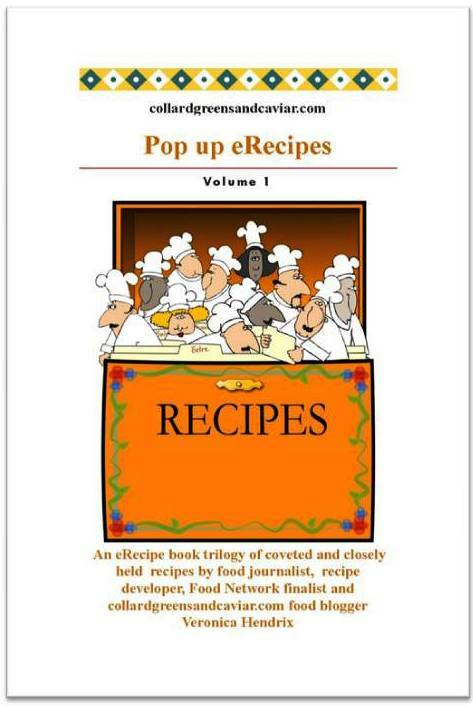 And by the way, that recipe is featured in my latest cookbook. The response from the viewers was amazing. A fried, crunchy, bite-size croquette made with chicken and vegetables made viewers drool. What viewers didn’t know at the time was those croquettes were a composite of my childhood and family history. That’s why making them looked so effortless, and they were. 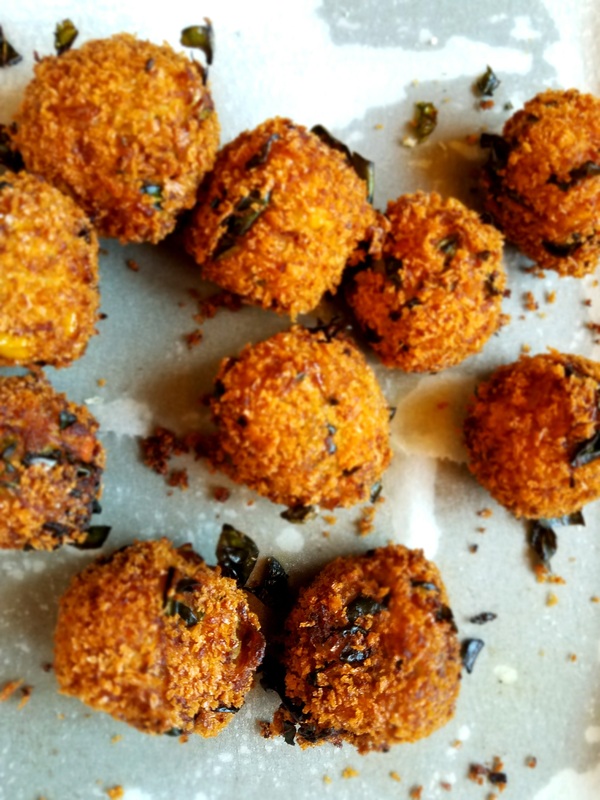 As a nod to my mom, my southern sensibilities and my love of croquettes, I developed a special croquette recipe that includes two of my favorite ingredients: collard greens and sweet potatoes. Just because it’s a vegan’s delight, completely dairy free doesn’t mean it isn’t packed with flavor and sheer satisfaction. Carnivore, pescatarian, vegetarian or vegan? It doesn’t matter. This croquette is for you. For this recipe, creamed corn and coconut flour are the perfect ingredients to bind it all together. 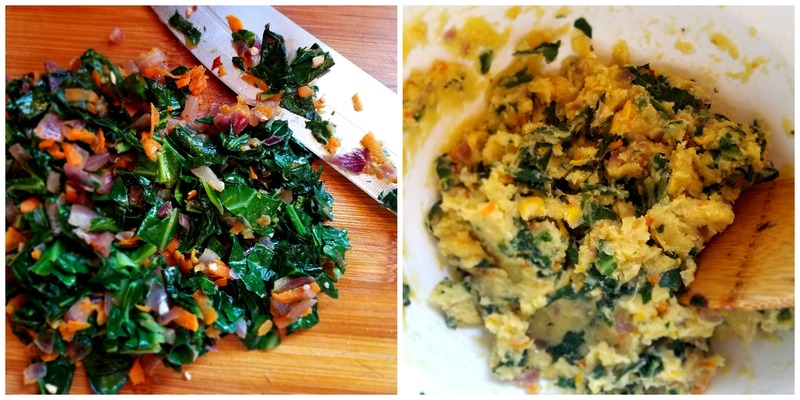 The use of fresh tarragon enhances the warmth of the collard greens and Jersey sweet potato. This recipe is a tasty departure from traditional salmon, chicken or potato croquettes. I call it “SoCali” to pay homage to my native Southern California roots and my Alabama family heritage. And one more thing – these golden brown little beauties could be the talk of your next soirée. 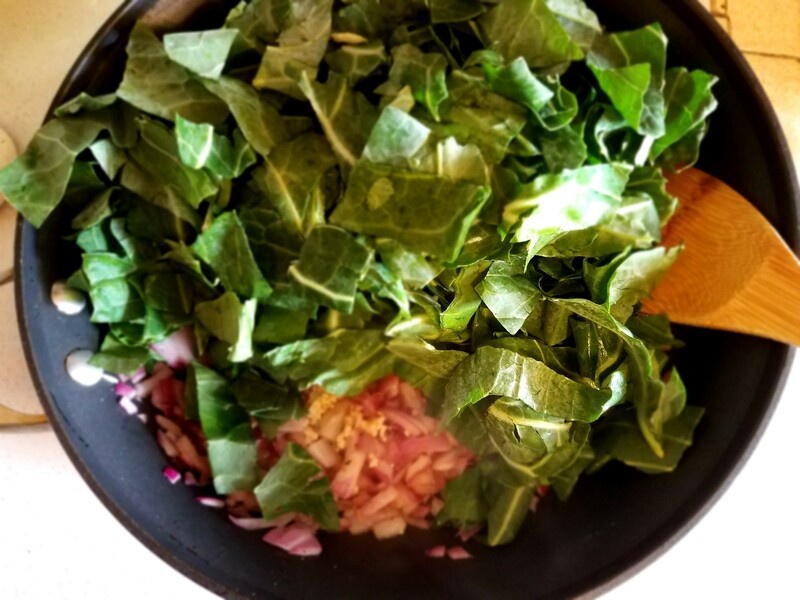 Thanks to the great folks at Cut’N Clean Greens for providing the collard greens to make this recipe. I’ve said enough. The recipe is below. And as always in parting, cook fearlessly and eat well my foodie friends. 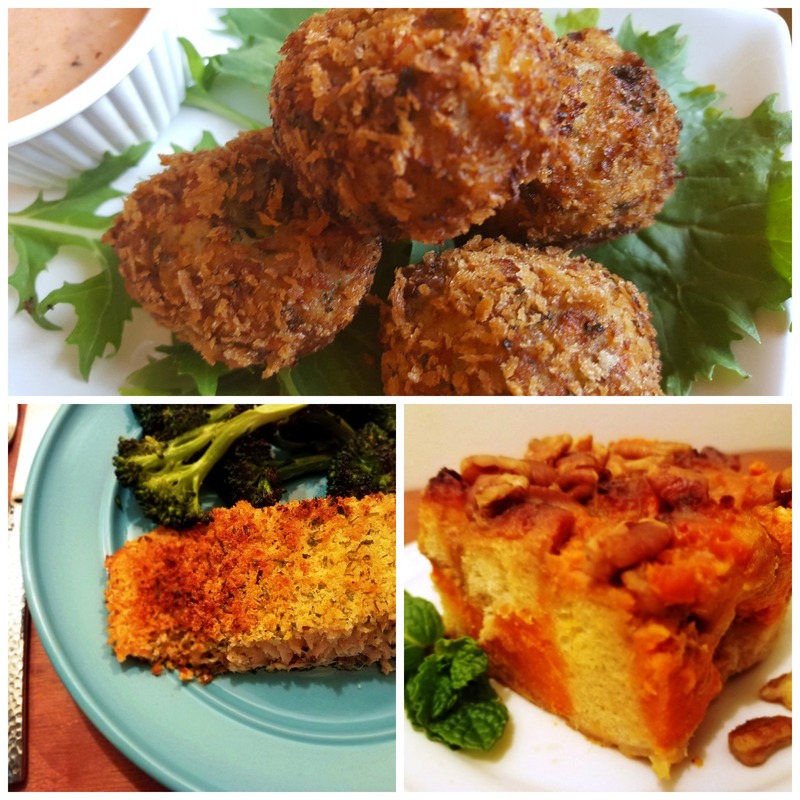 A delicious vegan and dairy free croquette made with collard greens and Jersey sweet potatoes. Prick Jersey sweet potatoes with a fork and bake or microwave them (which are white inside) until soft when skin is pressed. 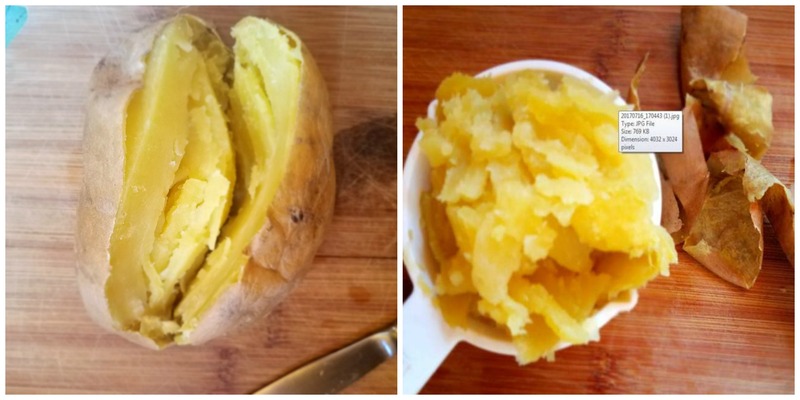 When done, remove skin and scoop out a total of two cups of Jersey Sweet potato filling. Place filling in a bowl and lightly mash, leaving lots of texture. Note: Microwave time can vary between 7 to 15 minutes depending on size and density. Baking time is approximately 45 minutes in a 400° F oven. Add 3 tablespoons of olive oil and 1 tablespoon of butter to a large skillet set on medium heat. When oil is heated, add chopped onions and cook 1 minute, stirring constantly unit till translucent. Add garlic and Cut’N Clean collard greens. Season greens with salt, pepper and red pepper flakes and sugar. Mix well and stir constantly over medium heat for 10-15 minutes until greens are tender and bright green. Stir in chopped tarragon and carrots. Remove from heat and cover for 15 minutes. Once greens mixture is cooled, place on cutting board and give it a rough chop, just to break up the larger cuts of greens. Add chopped greens mixture to the mixing bowl with the Jersey Sweet potatoes. Add 2 tablespoons of coconut flour and 2/3 cups of creamed corn. Blend until mixture comes together. Using a measuring table spoon, scoop up mixture and form into round balls. 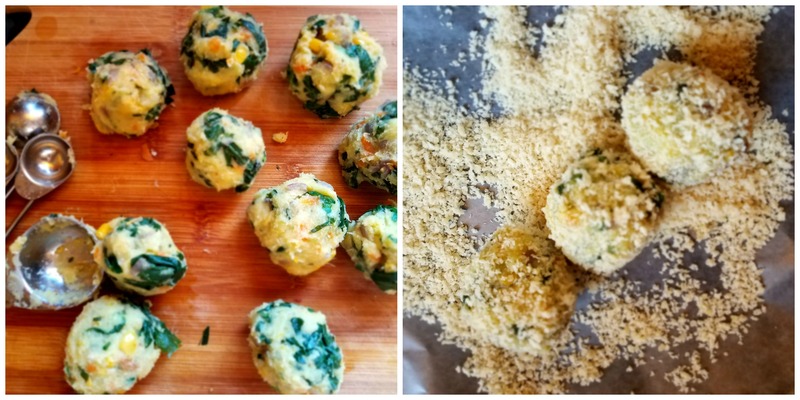 Coat each ball in Panko bread coating. If you use an electric deep fryer, follow the manufacturer’s instructions on how much oil to use. If using a sauce pan or small Dutch oven (as featured in this method) fill pan halfway with oil. 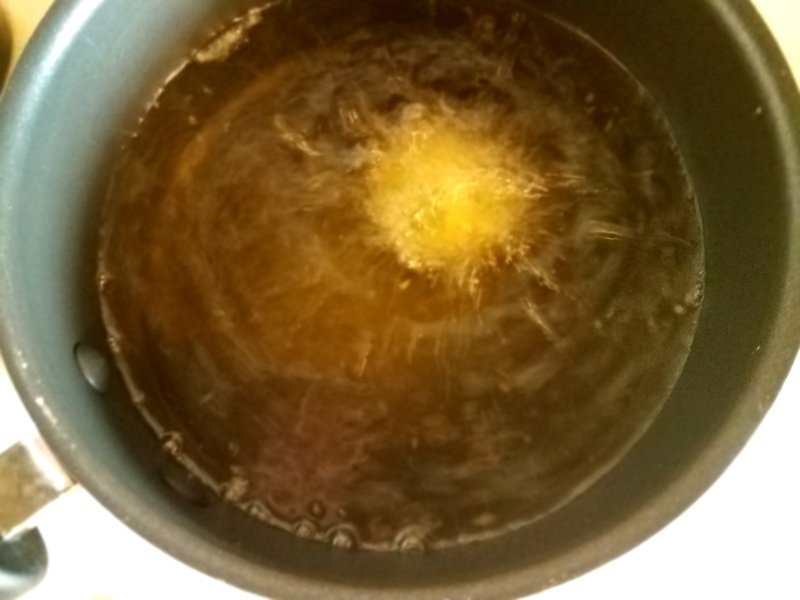 Preheat your oil to somewhere between 350° F to 375° F. Oil that’s ready for frying will bubble around the stick end of a wooden spoon when it’s inserted. If your oil begins to smoke, you know it’s too hot. With a slotted spoon or slotted spatula, carefully lower one test Panko coated croquette into the oil. Once it enters the hot oil, things happen fast. Be sure to stir with the slotted spoon while cooking — this will fry your croquette more evenly. Use this single croquette as a test to see how much time it takes to achieve your desired brownness. Just 30 seconds may be enough or you may need up to 60 seconds. Remove the test croquette from pan when done and drain on a plate or sheet pan lined with a paper towel. After your test croquette, lower no more than three Panko coated croquettes into the oil. Stir with the slotted spoon while frying. After 30 seconds or more, remove from oil, drain and repeat until all are deep fried. Serve with your favorite ranch dressing. Or for a smoky and spicier dipping sauce, thoroughly blend a teaspoon of chipotle chili pepper or a tablespoon of hot sauce into a cup of ranch dressing. 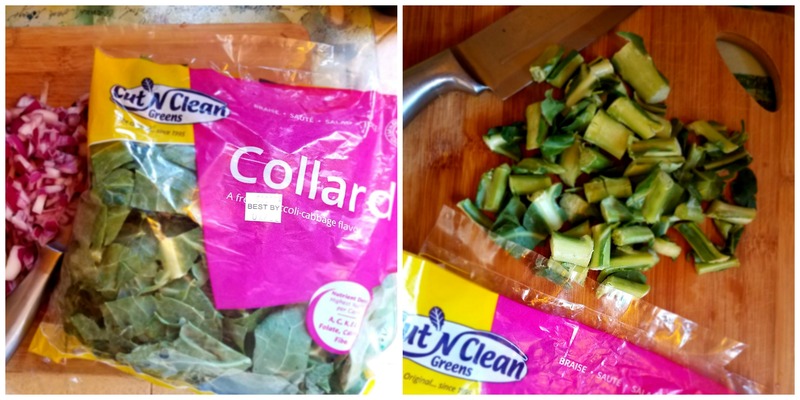 TIP: Make sure to remove stems from Cut’N Clean Greens before cooking. Baked Jersey Sweet potato, scooped out and ready for use. Saute of red onions, garlic, collard greens seasoned with salt, pepper, red pepper flakes and sugar. 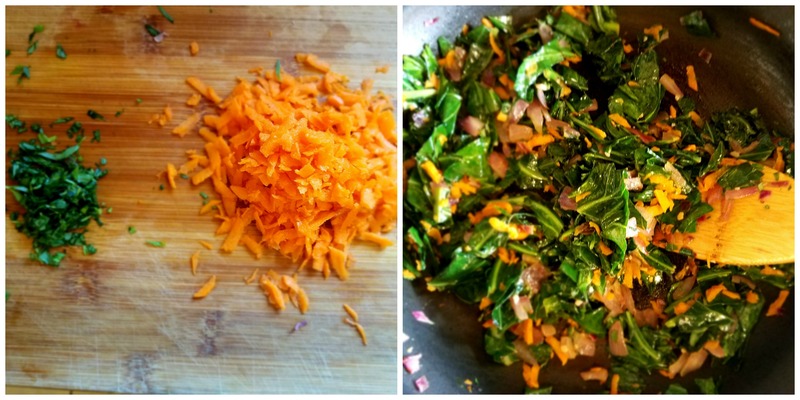 Fresh tarragon and grated carrots are added to the greens mixture. Greens mixture chopped and mixed with Jersey sweet potato, cream corn and coconut flour. 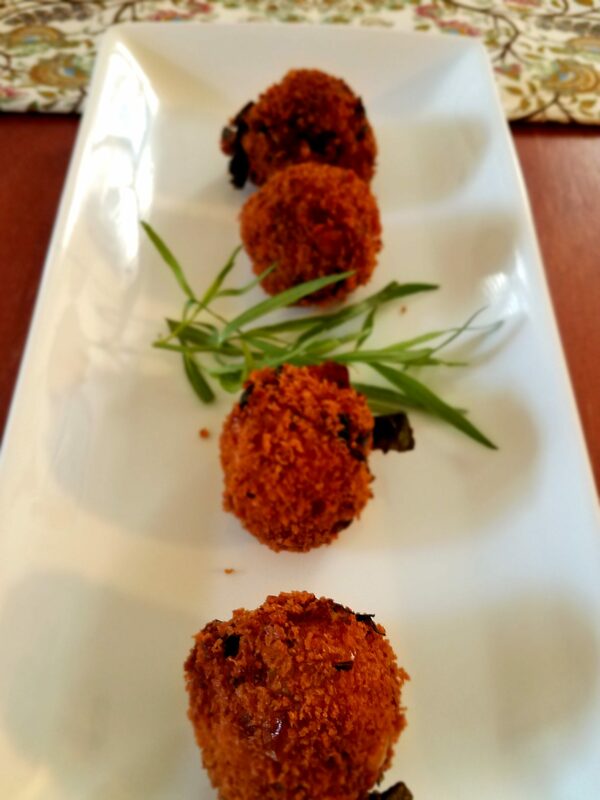 Croquettes formed and rolled in Panko bread coating. Croquette frying in hot oil. SoCali Vegetable Croquettes plated. Enjoy! Here’s a true story. The names have been changed. “Writing like this showed she not only had a sense of humor, but revealled she might have some cooking skills,” Bob said as he shared his storied account. After speaking on the phone, they discovered they both loved Italian food and decided their first date would be to meet at an Italian restaurant. They met, had immediate chemistry and got along swimmingly (that’s my word) after that first date. Bob and Dominique had three subsequent dates in which he took her to upscale and eclectic restaurants in Los Angeles. “I have just spot – Casa Domi,” she said. Bob was really excited about the offer to dine at her table. After all, her profile said “she loved to tinker around the stove top and was very intimate with her oven.” And besides that, he reasoned things must be moving along nicely with his new lady because he got an invite to dinner – something that has rarely happened to him. When Bob arrived, she greeted him at the door wearing an apron, the sign of a real cook he thought to himself. And the smell of garlic wafting through the air was almost intoxicating. He sat in the family room adjacent to the kitchen sipping a generous pour of pinot noir she gave in a beautiful etched, long stem wine glass. He could see a pot simmering on the stove top and vegetables for a salad on the cutting board. Bob said he felt like a little boy anxiously waiting for his favorite dish. Dominique called him to the table and they started with a garden salad and garlic bread. After they had finished the salad, she said it was time for the “ll platto principale” which she quipped meant “main course” in Italian. 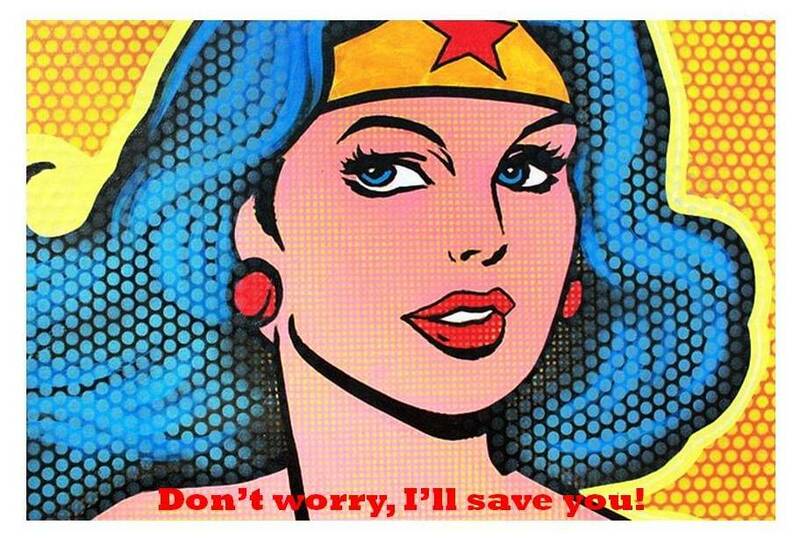 The bowl of pasta and ground meat she placed in front of him left him almost paralyzed. Never had he seen such an unappealing bowl of contents swimming in a red, waterly liquid. “It was an absolutely disappointing site Ronni,” said Bob, which is my nickname. “And to make matters worse, it tasted sweet and reminded me of Campbell’s SpaghettiOs with ground turkey pilled on top. Bob said he struggled through the meal and ate most of it. “My lady needed a serious recipe rescue Ronni,” said Bob adding that he just couldn’t bring himself to tell her how awful he thought it was. My friend Bob is a great guy. He’s stilling seeing his new lady and he asked me for a simple spaghetti recipe he can make when he invites her over for dinner. This is my go to recipe when I want to make spaghetti that is familiar, yet updated and slightly – if I dare say – elevated. The sauce is rustic and flavorful. The Kalmata olives give it a Mediterranean vibe. 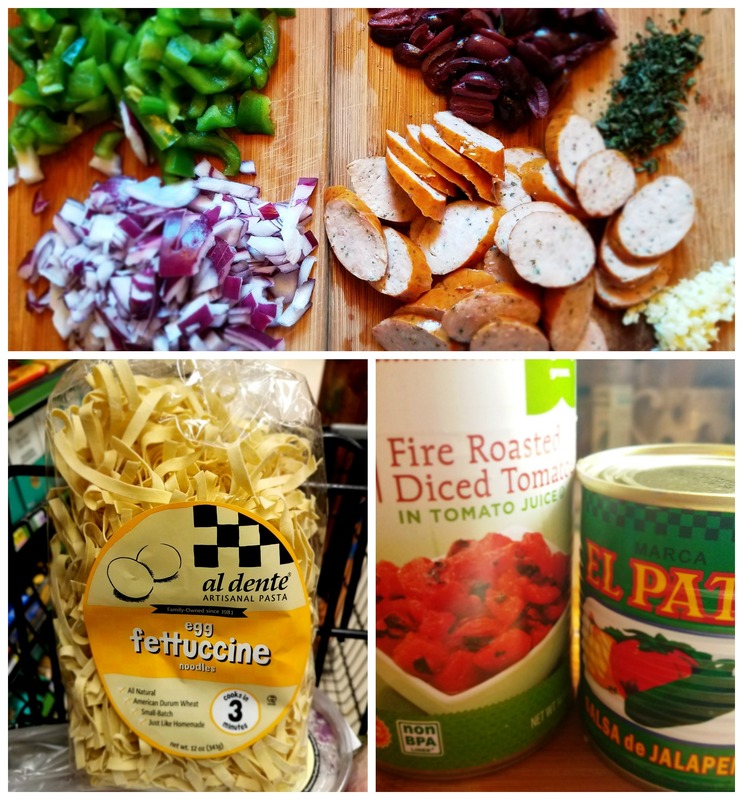 The sliced chicken garlic sausage is a healthier choice and takes this dish just beyond ordinary. Using the quick cooking fettuccine noodles makes it quick to get on the table so you can get to the business of enjoying the company of your date. A fresh, light, Italian-inspired pasta recipe perfect for an intimate dinner. 1. Fill a large Dutch oven pot with 5 quarts of water. Add 1 tablespoon of salt and bring to a boil. 2. Next, to a large non-stick skillet set on medium heat, add 3 tablespoons olive. When oil is heated, add chopped bell pepper and onions. Sauté 2-3 minutes until tender, stirring frequently. 3. 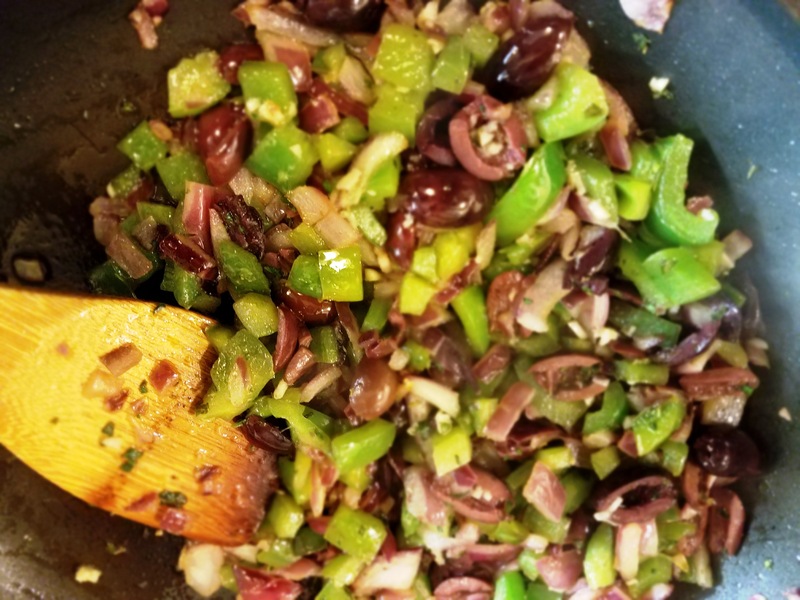 Add garlic, chopped oregano and halved Kalmata olives and sauté until garlic is fragrant, stirring frequently, about an additional 1-2 minutes. 4. Add can of fire roasted diced tomatoes, tomato sauce, 1/3 cup olive oil, salt and pepper to the skillet. Stir well. Cover and simmer slowly for 15 minutes. 5. To a separate non stick pan, add a little olive oil and lightly brown sausage slices on each side. Once browned, remove from pan and set aside on a plate lined with a paper towel. 6. Add pasta to the water, which should be boiling vigorously at this point. Cook pasta according to al dente instructions. 7. Once pasta is done, drain thoroughly and add pasta along with browned sausage slices to simmering tomato mixture. Use a large wooden spoon or thongs to gently toss and incorporate noodles and sausage into the sauce. Turn off heat and cover. 8. Serve with fresh chopped basil or flat leaf parsley and Parmesan cheese. Makes about 4 servings. Simple ingredients make this dish easy and delicious. This sauté of onions, bell pepper, garlic, chopped oregano, oregano and halved Kalmata olives is intoxicating. All ingredients incorporated and pasta is ready to be plated. Easy Date Night Pasta plated with fresh chopped flat leaf parsley and grated Parmesan cheese.